Once you start down the HomeKit route, the convenience of having everything controlled from a single app is pretty addictive. So these days I view HomeKit compatibility as a pretty non-negotiable item with any smart home tech. But there are limits. And paying £16,500 ($22,000) for a Lutron system was definitely well beyond them! However, the thing about having a lot of windows – especially floor to ceiling ones – is that good-quality blinds are expensive no matter what. And in the winter garden (glazed balcony) in particular, which is where we spend a huge amount of our time, we wanted really nice ones. I should explain that we didn’t decide on spending that kind of money casually. It was a somewhat gradual process. 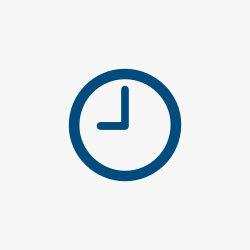 My partner loves Luxaflex Duette blinds – which I’ll talk more about in a moment. These aren’t cheap anyway, and the particular ones we liked did, of course, turn out to be one of the more expensive models. By the time we’d multiplied the price by the number we needed, the cost was already well into ‘brace yourselves’ levels. And, the thing is, once you’re buying expensive blinds, the percentage premium to make them motorized isn’t actually that high. 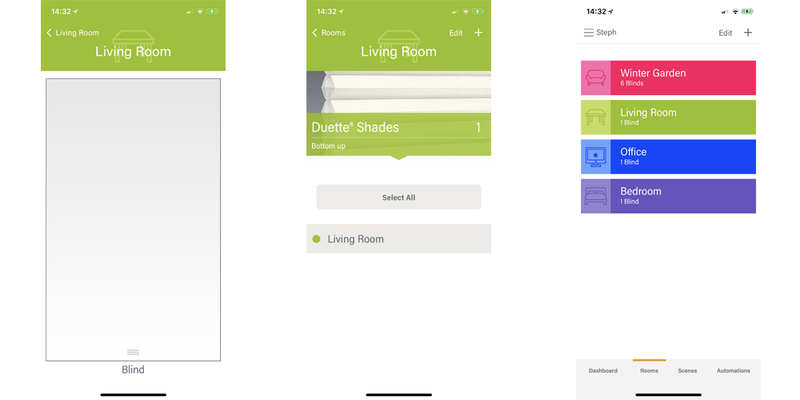 Which was when I discovered that there was the option to add a hub for smartphone control, and a little research found that the company has promised HomeKit support via a firmware update in the first quarter of this year. Luxaflex Duette blinds are so named because they have two layers of fabric in a concertina construction that creates a pocket of air between them. The dual layer helps keep out light (these are blackout blinds), and the trapped air offers a reasonable degree of thermal insulation. This allows them to keep heat in the room in winter, while keeping the heat out during the hottest part of the day in summer. One of the things we wanted in the winter garden was to be able to enjoy the view in the day without being blinded by the sun. Since the sun tracks round from left to right in the course of the day, we wanted the ability to lower each blind by just the right amount, so we opted for each window column to be a separate blind. Once we had this arrangement, however, we found we were using it at night too. In winter, to avoid wasting heat, we arranged the blinds so we had a complete view of the city from the sofa, but all unnecessary blinds were closed – and the blinds just in front of us are partially closed. 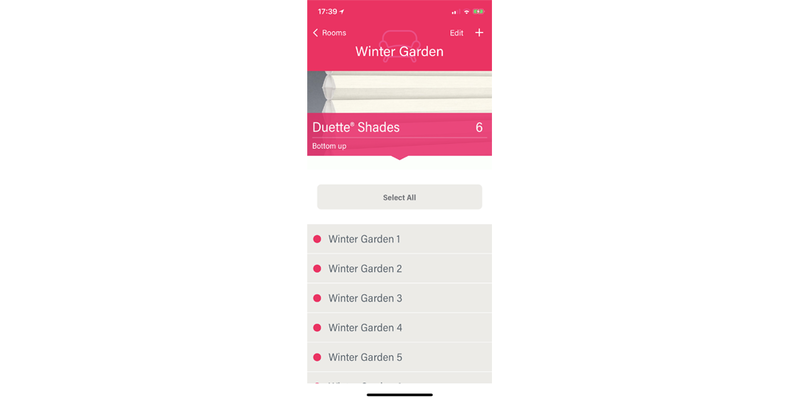 Of course, when you have a total of ten blinds, and especially when you want to configure them very specifically, scenes are your friend – and we’ll talk about that in iPhone control, below. We did have a problem with the blinds when they were first fitted. The auto-levelling feature, which ensures that all the blinds rise to the same point – aesthetically essential when you have seven of them side by side – wasn’t working. In the case of the full-height ones in the winter garden, it also meant they didn’t immediately stop on reaching the floor, so they tended to splay out a little. The combination of the two meant that they soon ended up looking a little wonky, but the company has today resolved this. If you note me referring to seven winter garden blinds while you only see six, that’s because one of the blind casings was supplied in the wrong color, so that too is being replaced. I have to say the dealer has been very apologetic and responsive with both issues, and my own attitude is that I understand things can go wrong – mostly what I care about is how well the company reacts. Anyone with recent-generation motorized blinds will already know this, but I was surprised to find that the blinds are battery-powered. Apparently modern motors are sufficiently efficient to make this practical, and it of course greatly simplifies installation. Luxaflex claims that the batteries last a year, which is perhaps less surprising when I tell you that each blind has twelve AAs. So I’m going to need to significantly add to my collection of AA Eneloops! The company did also warn that most owners see reduced battery-life in the first year, because they play with them much more when they first get them, and also show them to friends. Opting for motorized blinds gets you a pebble-shaped physical remote. 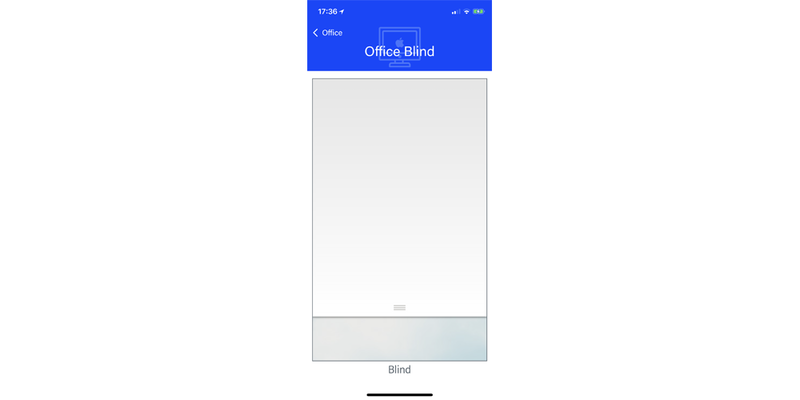 This is pretty clever: you can control up to six blinds, or groups of blinds, individually; you can arbitrarily select multiple blinds and control them as a group; and there’s an All button to control all your blinds simultaneously. The remote is also motion-sensitive, so the backlighting on the buttons comes on when you pick it up. It is, however, limited to six blinds or sets of blinds. The hub is what gets you iPhone control. This is similar to a Philips Hue hub, and plugs into an Ethernet port on your router. At £300 ($400), it’s not cheap, but in the context of our total spend on the blinds, it would have been silly not to do it. And it transforms control of the blinds, as you’ll see. Luxaflex promises HomeKit support sometime this quarter. Of course, promising it and actually offering it are two different things, but in this case I do tend to believe it will happen. 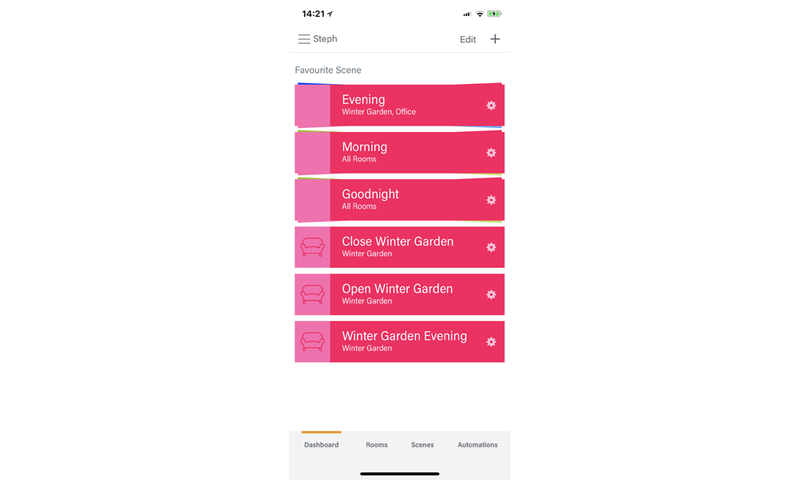 The app already supports scenes, so either it’s all set for support or we’ll just have to continue using a separate app for the blinds but still have most of the benefits. The main reasons I’d like HomeKit support are to combine control of lights and blinds in scenes, and to have Siri control of the blinds. At its most basic, you can tap Rooms, tap the room you want, tap the blind and then get a visual representation of the blind in question. You can then simply drag the bottom of the blind to the position you want: fully-up, fully-down or anywhere between. In rooms with multiple blinds, you also have a Select All option. With this, you can raise or lower all blinds in the room to the same position. But if you want to simultaneously control blinds in multiple rooms, or to do anything more complex than setting all blinds to the same position, you’ll want to use Scenes. If you’re wondering why this scene only partially opens the bedroom blind, it’s because Steph gets up an hour before I do (part of the joy of working from home! ), so we let in enough light for her to see what she’s doing without too rude an awakening for me. I have to say that creating scenes in the PowerView app used by Luxaflex is a little fiddly. First, you have to create a scene for each room – even if that ‘scene’ is simply opening or closing one blind. Once you’ve done that, you then tap a different button for Multi-room Scene and can then combine the room scenes as you like. So to create the Morning scene above, for example, I actually had to create five different scenes. But I only added the Multi-Room scene to my favorites, so only that shows up on my dashboard. Another oddity is that, as you select the blind positions you want while creating the scene, the hub immediately moves each blind to that position. I’m guessing that’s to provide immediate visual feedback to ensure you are doing exactly what you think you’re doing, but it does make the process a little slower than it would otherwise be. But setting up scenes is a one-off process, so it’s not too great a hardship. One thing it doesn’t allow you to do, though, is reorder them: that Edit button only allows you to delete scenes. So you’re stuck with them in the order in which they were created. Another annoying thing about the app is that the tabs at the bottom of the screen are not persistent. For example, if you tap Rooms and then, say Living Room and then an individual blind in that room to control it manually, the only way to get back to the Dashboard is to reverse that journey. In this case, tap Living Room top-left, and then Rooms. Only at that point can you tap Dashboard. But these are minor complaints. The overall experience is fantastic. The blinds are great – they look really good, block light completely, and the motors are smooth. Scenes are brilliant. All in all, we couldn’t be happier with them. You can see the whole apartment setup in action in the video below. So that’s a very expensive Smart Home Diary update! We have done a few more things. We’ve installed underfloor heating in the winter garden, so no longer need the radiator in there. We gave in and fitted Hue bulbs to the rest of the lights. Oh, and when it came to wardrobe lighting, we found that Hue Lightstrips were so much brighter than anything else that we opted for those – complete with motion sensors on the doors to activate them. Which did bring up one rather silly limitation: Hue motion sensors can only switch on lighting in an entire room. We, of course, wanted them to come on only in the wardrobes. So I had to cheat and create two fake rooms – Ben’s Wardrobe and Steph’s Wardrobe – and assign the lightstrips to those. We do have one other expensive smart home update to follow. The apartment has a mix of storage heaters and rather inefficient electric radiators, all of which are ridiculously large, so we’re replacing these with more efficient (and smaller) electric radiators. Of course, I immediately started Googling for smart ones. The ones we’ve chosen come with a hub that allow iPhone control – though probably not HomeKit compatibility – so I’ll update with a new diary once those are installed in a month or so. As always, I love reading about your own smart home setups, so do keep sharing details in the comments.